This is an outline of the of the fees and keys stages involved in the debt collection process. This applies to debts up to £100,000. Your claim will be handled by one of our experienced Solicitor Directors (minimum 5 years’ experience of debt collection) throughout. Where the debtor is an individual, a limited company or firm (a partnership) we can send a Letter Before Claim to the debtor which requests payment from the debtor within 7 days. We can send a Late Payment Demand, which claims your basic debt, interest, compensation and your reasonable debt collection costs under the Late Payment of Commercial Debts (Interest) Act 1998, provided both parties were acting in the course of a business. The Pre-Action Debt Collection Protocol applies from 1.10.2017 to any business (including sole traders and public bodies) claiming a debt from an individual (including a sole trader). Our charge is £75+VAT for letters containing up to 15 printed sheets of A4 paper and postage. If the letter contains between 15 and 50 printed sheets the actual additional postage will be charged in addition to the £75 +VAT. 50 printed sheets are the maximum we will include in a pre-action protocol letter. If the debt is paid at this stage, you will not be charged any of the fees listed below. The Total column is the amount you pay whether or not the debt has been paid at this stage. The Court calculates the fee on the total of the debt plus interest, which may put the Court fees and costs into the higher band. There are limited circumstances where we can cancel the Court action on the day of processing. Where we can do so, a cancellation charge of no more than the equivalent of the non-refundable costs’ element will apply, otherwise, the total costs and fees will be payable. Defended actions and other matters referred to us as litigation matters will be charged separately by us on a time basis. 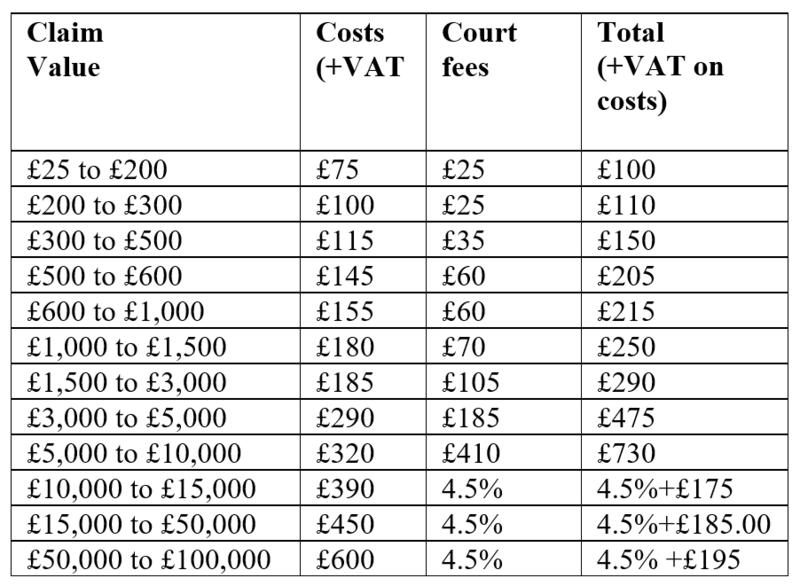 The Court calculates the Enforcement Fee on the Judgment Total which may mean that the fee is put into the higher band (if the enforcement is not issued through the County Court on-line process). If the debtor files an Acknowledgment of Service, the costs increase by £3 for debts up to £5000 and by £5 for debts over £5000. The High Court Enforcement Officer (HCEO) will collect their charges direct from the debtor. If the HCEO is unsuccessful there is an abortive fee payable, which is generally £75 +VAT. Where applicable, we will automatically instruct the HCEO in every case over £600. Stage 3 costs are based on default proceedings where the HCEO or Bailiff is instructed. Judgment Costs are calculated on the total of the balance of the debt plus the fixed costs and fees on issue plus interest. There are limited circumstances where we can cancel the Court action on the day of processing. Where we can do so, a cancellation charge of no more than the equivalent of the non-refundable costs’ element will apply, otherwise, the total costs and fees will be payable. Where applicable, we will instruct the High Court Enforcement Officer (HCEO) in every case over £600. Please note that there are other methods of enforcement that may be appropriate for you to use, depending on the value of the Claim and the debtor’s circumstances. Please ask us for details.